Wild Space 360°: Finale, showdown on the ramp. Paul Gaudynski photo. Above and below, within and without, near and far — Debra Loewen‘s Milwaukee 360º charms and delights from every angle. 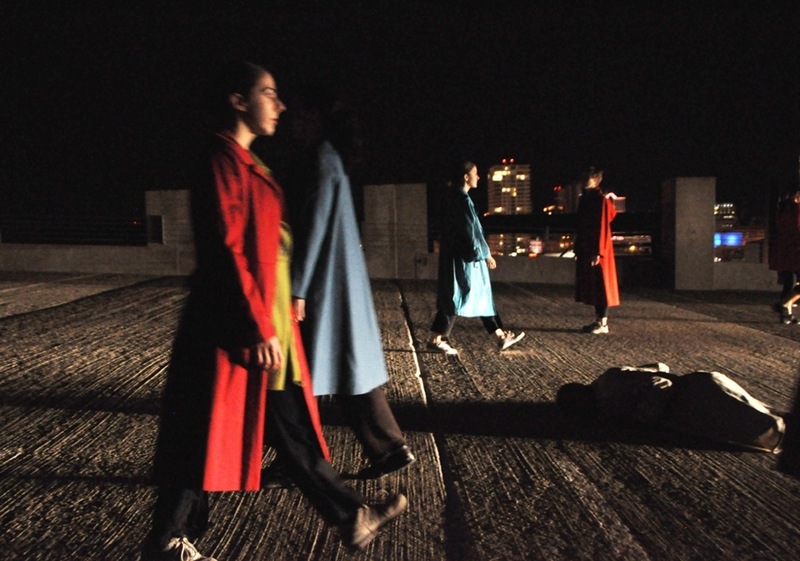 Loewen’s Wild Space company danced the site-specific piece Thursday night in, around and atop the eight-story Brewery Parking Structure, in the Pabst complex at 910 W. Juneau. Loewen has created many such works and often intends to frame an environment as much as display her dancers. Thursday, she made a humdrum parking ramp glamorous and mysterious and alerted us to the spectacular downtown views beyond the east railing of the place. Mauriah Kraker, showcased in the window in Wild Space’s “360°.” Paul Gaudynski photo. Still, the balance tilts toward the dancing in 360º. The dances at the outset, in a huge, unfinished room at ground level, are among the most subtle, original and convincing that Loewen has ever made. She called for some physical virtuosity from her dancers here and there, but this is mainly about poise, presence, precise placement and exact tone. Her able dancers neatly articulated the four levels of the work: casual, graceful/meditative, grotesque and aggressive. Wild Space ran a three-ring circus in the big space, and the audience switched places to catch each of the dances as they repeated three times in each ring. A fourth ring encircled the whole, as dancers outside the building appeared in the panoramic windows. By design, unsuspecting civilians became a fifth and outermost ring as they passed the building, often to comic effect. Jan Kellogg lighted the dancers intensely and directly, and no one in the crowd of 150 or so was more than a few feet from them. So everything felt hyper-real, or maybe surreal. The shadow play on the walls behind the dancers and the grotesque moves further heightened the dream-like aspect. Loewen dreamed up and the dancers delivered a range of odd, striking shapes of body and limb, most notably a spine/hip trick that potted out the bellies of people with practically no bellies. This bizarre and fascinating posture made for bizarre and fascinating locomotion. Such shapes and movement contrasted sharply with the poise and beautiful placement of the meditative dancing. In the east ring, four women opened with an exaggerated but calm walk. They raised their knees high and at the peak of the lift extended their lower legs in controlled and stately fashion. The knee traced a circular path in this step, and the arms traced billowing circles to echo the knees as the dancers advanced. The company’s women, looking lovely in nice jerseys with horizontal stripes in various colors, had most of the great many meditative steps, rendered in solos, duos, trios and quartets. These dances had in common a soft, pliant tread into the concrete floor, elegant placement and finish and excellent ensemble. As I watched the first dance, I heard many bangs and booms behind me. When I moved on to the next ring, I found that those were the sounds of men crashing into drywall. The men played the instigators, the disruptors. They flew into the women’s calm dances, crashed into the walls and left aggressive agitation in their wakes. The men did have their big, physical moments – José Luis, for example, gave a burning solo in place and practically mashed up against a plate glass window – but they also spent time hanging around outside. They wore trench coats and peered in at the women, with just enough presence to mark themselves as part of the piece. Seen from above, dashing through a field of stones, in “Milwaukee 360.” Wild Space photo. Ambient sound accompanied all of this, along with music played live by Tim Russell (composer) and Nick Zoulek, on a variety of percussion and wind instruments. I believe they improvised within an overall plan. No beat drives these dances, which unfold in their own rhythms. Russell and Zoulek responded to the choreographic impulses with sensitivity and wit. As we moved to the eighth floor, 360º became more about the place and less about dance. We first peered down, where dancers in brightly colored topcoats dashed about a rocky lot. When we turned around to the parking deck, dancers had miraculously ensconced themselves in or around three cars for comic vignettes. Joe Pikalek looked ominous in his hat and trench; it was his job to keep Bridgett Tegen from escaping from the trunk. Joe Fransee and Liz Herbst Fransee, the train of her wedding dress caught in a stuck Mustang door, acted out a honeymoon nightmare. Joe was hilarious in his Ford convertible gymnastics as he attempted to free his bride. Hopelessly lost Molly Mingey consulted wind-blown road maps and scouted from atop her car in a vain search for Lake Michigan. Laura Murphy and Joe Pikalek exchange glances on the ground floor in “360°.” Paul Gaudynski photo. Down the ramp, Allison Kaminsky perched on a five-foot wall in a way that made her appear to be on top of the world. Angela Fredrick, Lindsey Krygowski and Yeng Vang-Strath danced an easygoing trio about moving to and from the north railing at right angles. Alberto Cambra, José Luis and Mauriah Kraker made like Egyptians in a dance that flattened them against the west wall. Between these threesomes, Russell (ride cymbal) and Zoulek (saxophone) played bluesy music that fit the mood of noir mystery. Car horns and alarms summoned audience and dancers to the ramp half a level down. A phalanx of five cars switched on lights to illuminate the slanted ramp. Dancers in equal numbers advanced in opposite directions. The vibe was OK Corral. Dancers did fall, but gently, and soon rose again. Loewen gave the last word to the exquisite Mauriah Kraker. She phrased and shaped her gentle, spare, meditative solo so clearly as to fill this vast space and shine as brightly as the city lights around her. Performances are at 8 p.m. Thursday through Saturday, Sept. 20-22, at The Brewery Parking Structure, 910 W. Juneau Ave., with a pre-show talk by Jim Haertel of Best Place at 7:15 p.m. Admission is $25 for premium tickets, which include Haertel’s talk, $20 for regular admission, $15 for students and seniors. Call 414/271-0712 or online at Wild Space website. Also in the cast: Laura Murphy, Jessie Mae Scibek. Keep up with Wild Space and all of Milwaukee’s performing arts. Bookmark Matthew Reddin’s TCD Guide to the 2012-13 Season. Sponsored by the Florentine Opera. 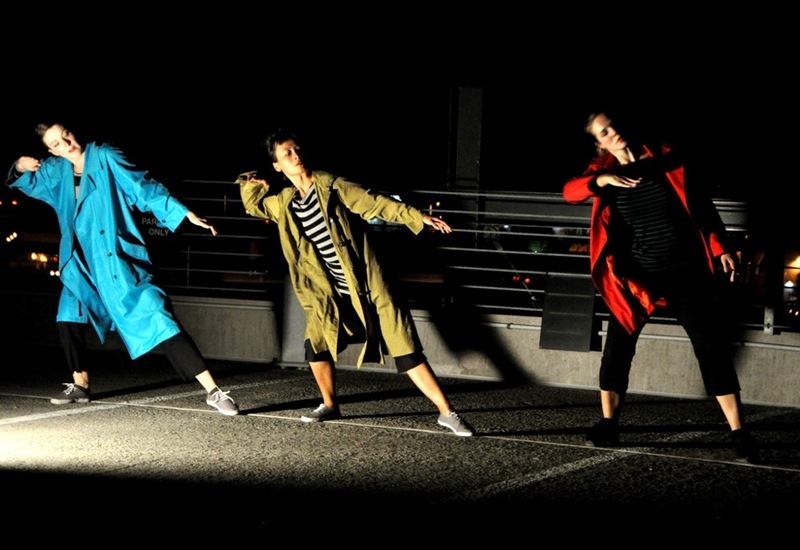 Lindsey Kryzgowski, Yeng Vang-Strath and Angela Frederick, at the north rail in “Milwaukee 360°.” Paul Gaudynski photo.